I can’t remember if I’ve mentioned why I’m hanging out at a middle school for the summer, so I’ll explain. The Anchorage School District has a Camper Host program much like those of the National Forests, National Parks, State Parks etc. What happens is, folks with motorhomes get to stay at a particular place for free including utilities and dumping/pumping services in exchange for various chores like fee collection, security, and/or minor maintenance/janitorial work. 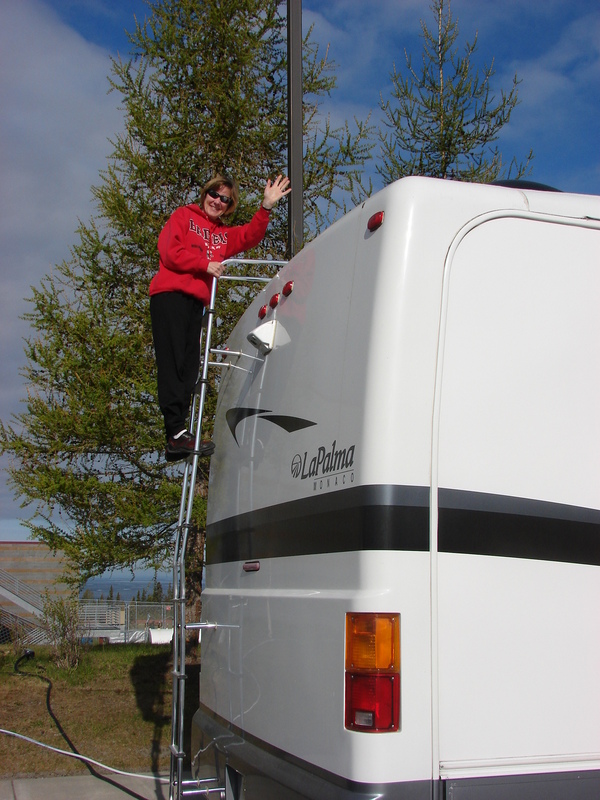 It is a great way for people traveling up here in their RV’s to save on expenses. All the ASD expects of me is my presence which they have determined will reduce summer vandalism of this and other area schools where camper hosts reside. What a deal. I had my first visitor at my new summer home this morning. My good friend Marilyn. Leave it to Marilyn to think of climbing the ladder to check out the roof before anything else. Say hello to Marilyn everyone! In addition to receiving my first visitor, today’s activities included about 7 hours of Census work (yes, Census enumerator is one of my many hats) and confirming my June reservations for Denali National Park. How exciting. I’ll be taking Dora, the hound dogs, and my best Buddy-Bear, Aaron (age 10) up to Denali for 5 days. I can’t wait. Wonder Lake is on my bucket list, so it’ll be great to finally get all the way back there (it’s almost 90 miles in, I’ve only been to mile 29). The weather is still particularly sunny. Hope it holds for my friends from Florida who are flying in on Monday. Stay tuned. BTW, for those of you emailing me and not receiving responses…I’m having trouble with outgoing mail at the moment. My apologies. So for all of you out there, what is on your bucket lists? I’m writing down mine today.